Cablefree Solutions is a dynamic new company formed to create free-space optical broadband wireless communications systems for the 21st century. The focus of the company is primarily on technology for connecting high-speed digital data networks through the atmosphere using point-to-point infra-red light beams. The huge benefits of free-space optical technology include immense bandwidths previously obtainable only over fibre-optic cable, genuine ‘cable-free’ point-to-point connection and freedom from stringent radio licensing regulations. Cablefree systems are quick to install, reliable, safe and future-proof with low running costs. Data networks which are separated by a clear line-of-sight path over 4 kilometres can be connected with an installation that typically takes 2-3 hours, overcoming traditional limitations of cable, fibre-optic, microwave, or leased-line systems. A close analysis of market demand has led to a versatile communications system capable of connecting not only data and telecommunications networks, but also relaying single or multiple channels of CCTV security images, transmitting analogue or digital broadcast television pictures, and is suited to both permanent and temporary installations. Separate office blocks, each with corporate data networks (e.g. Ethernet, Token Ring, ATM) which need to be connected. The ground between premises is either public property or cannot be excavated. Conventional leased-lines (e.g. BT Megastream) are expensive or lack high-speed (>100 Mbps) performance. Bids for installing telecommunications in developing countries typically involves terrestrial microwave links between cities but licensing, interference and reflections from buildings prohibit the use of microwave to connect the central city telephone exchange(s) to the nearest microwave tower. Digging up the city streets to install cables is expensive, slow and causes disruption. Construction companies need on-site data communications between computers in temporary buildings or vehicles to facilitate management of a large and complex project. Cables would be broken by passing vehicles and would need moving frequently and licenses for radio or microwave systems might not be granted for mobile use or in all regions. Media coverage of a major sports event involves many TV cameras connected to a field mixing / commentary studio. Conventionally, this requires kilometres of cable and days of installation time. The event may take place in a country where licensing for microwave links cannot be obtained quickly, the spectrum is overcrowded or interference likely. Television studios require cost-efficient backup links either between the studio buildings or between the studio and the transmission mast / satellite earth terminal to avoid ‘down-time’ and consequent break in transmission. In a 24 hour service, maintenance to the main system may regularly require use of the backup. Commercially sensitive or governmental / military operations require data links which cannot easily be intercepted and not without the knowledge of the operator. The near-impossibility of partially-intercepting the narrow beam of an optical system without break in the original transmission path or without radical change in received signal level is a major benefit of free-space optical transmission technology. 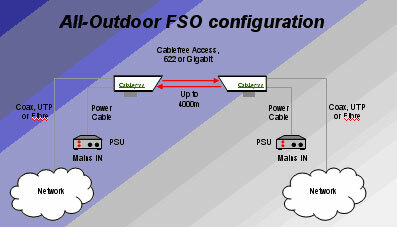 Cablefree Solutions Limited is based in Middlesex, UK. Currently enjoying its position as a technological leader in infrared free-space communications, Cablefree maintains active R&D programmes allied to strategic marketing of current products to ensure that the company offers consistently superior product performance over comparable commercial systems.